This is part of a series of posts about a four week youth expedition to Alaska that I led in during the summer of 2010. There was no doubt about it after our trek in the Wrangell Mountains we were exhausted. The weather was punishing and our 55 mile journey had been both physically and mentally demanding. As I said at the start of this series of posts this was the hardest and remotest expedition I have ever done with young people. After the trek we took our shuttle charter to Fairbanks Alaska and stayed at one of my favorite places in the world – Billie’s Backpackers! I had stayed at Billie’s Backpackers in 2005 with a group of students from Knox Academy in Haddington. Joe, who was running the place at the time asked me if I would ever be back – I told him then that I would. He greeted me from the bus with a beaming face announcing that, ‘I remember you’ and that he still has his, 'Knox Academy Expedition T-shirt’. We stayed in Fairbanks for a couple of nights, ate, fixed clothing, fixed gear, fixed ourselves and bought supplies for the next leg of our adventure. Our biggest challenge was getting the weight of our equipment down – in the Arctic, where most of the travel is by small bush plane and you are charged by the pound! After two days rest we headed to Bettles Air at Fairbanks Airport where we flew in two groups to Bettles Lodge. Bettles is a very small village north of the Arctic Circle where pretty much all Arctic Expeditions to the Alaskan Arctic are launched from. We flew to Bettles in two groups and when we arrived pitched our tents next to the runway. The people at Bettles Lodge were lovely and could not have been more helpful – we ate in the Lodge during our stay and were treated to home made Pitza and also fresh sheefish. We also took part in our Gates of the Arctic National Park Orientation. National Park orientation is compulsory for all groups who are going into the National Park. It involves a talk with one of the rangers, watching a video on low impact procedure and then an opportunity for question and answers. Whilst at Bettles we also had the massive job of sorting out all our food for the next leg of the journey. This was no small task as everything had to be divided up and packed into bear barrels. Again we were concerned about weight and everything was cut down to a minimum. We also pumped up and tested the inflatable canoes that we would be using on the next leg of our journey. In the evening we chatted to other people staying at the Lodge, read books and at 10pm most nights watched the huskies being exercised around the air strip. They exercised by towing an old VW Beatle – it was quite a sight! 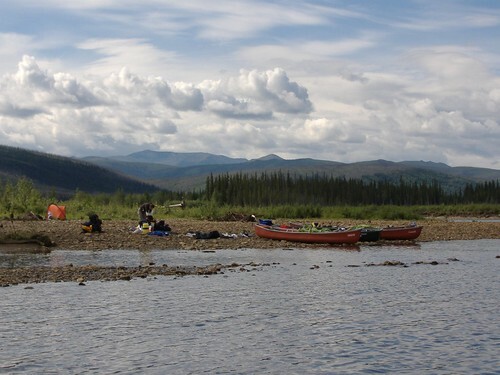 From Bettles Lodge our aim was the canoe the Noatak River from its headwaters to Noatak Village. The headwaters of the Noatak were deep within the Gates of the Arctic National Park and about a 1 hour flight from Bettles. To get there we had chartered three float planes. After a days delay due to bad weather we finally loaded up the first plane with as much gear as it would carry and off we went back into the wilderness. In my next Alaska post I’ll talk about the early stages of our adventures on the Noatak River. The alarm went of at 5am and it was raining (what a surprise!). The good news was that the river was down slightly from the day before (we couldn’t hear the rocks moving!). We quickly packed our things and moved down to the crossing point where the path across was still marked with the rock cairns from the day before. The river felt cold but we safely got the whole group across. We took no chances on the slightly deeper sections, making sure that we huddled together to protect the smaller members of the group. The river crossing was in about seven parts and we stopped at the other side to empty our boots. Next we traversed back up the side of the Kotsina River until we crossed Roaring Creek and were able to start the first part of our long climb up the hill in front of us. The terrain was surreal and we climbed higher and higher up the side of the Kotsina Valley in head height willow. A few of the group got stung as we disturbed four hornets nests during our accent. Keeping a close eye on the altimeter at 3, 500 feet we started to traverse back round to the upper stages of Roaring Creek before dropping down to the creek itself. The decent to the creek was horrible. The ground was wet and much of the terrain was on mud and vegetation. We had to be really carful with our footwork and I think we were all pleased when we finally made it back down to the river where we ate a late lunch. From here we followed Roaring Creek up into a beautiful valley for about a mile before starting the steep climb up towards our final pass of the trek. The route took us through an old mining area from the gold and copper rushes of the early 1900’s – there were still a few artifacts scattered around the hillside mostly in the form of tins and wooden foundations. It is funny, because in the UK I think these artifacts would be considered litter but in this part of remote North America they were definitely considered pieces of history! The route went on and on and the ground got steeper and steeper. As we climbed to nearly 6000ft the weather and the mist started to close in on us. We kept telling ourselves that we must be near the top only to find another hill to climb or set of old mine workings to climb over. Finally, at the top of one particularly large hill we thought we must be at the top as the ground leveled out. Visibility was practically zero and it was difficult to see where to go. I turned the GPS on as I waited for the others to catch up. As it was collecting satellites the mist cleared a little bit revealing a massive rock amphitheatre – I could see no way over the ridge in front of us and it looked vertical (perhaps even over hanging in places). The area became quickly nicknamed as 'Mordor'. We had been keen to get up and over the ridge on day 7 but we had already had a massive day and the group was tired (and so was I!). It was also going to take a bit of time to investigate how to get over the huge obstacle in front of us. We made the decision to camp. Although there was no fresh water there were plenty of patches of snow around to melt and provide water to cook our dinner. We left the group collecting water and Mark and I went off to investigate the route ahead. We eventually found a route over the ridge – it was steep (and not as obvious as the guidebook suggested!) but it would definitely ‘go’. By the time we got back to camp everyone else was in bed apart from Clive who was busy cooking our dinner. The sun had dropped behind the rock wall and the temperature quickly dropped and we retreated quickly to the protection of our tent. Sleep was difficult during the night as the wind picked up and battered us from every angle. It was raining and windy when the alarm went off. A quick glance out of the tent revealed that the other tents had been battered by the wind during the night. We decided to stay inside for another hour until the air temperature increased slightly. At 6am I got out of our tent thinking the rain had stopped (I couldn’t hear it on the tent anymore) only to find out that it was snowing. It was time to get out of there – we packed our stuff away in record time and headed towards the ridge. As the sun started to peer through the mist the snow storm stopped and we started our steep climb up towards the pass. This was the steepest of all of our climbs so far – but at least we new it was the last one. Despite the weather the views at the top were spectacular and we re-grouped on the narrow ledge before starting our decent that followed some old sheep tracks down towards Nugget Creek. I have to admit that seeing Nugget Creek was a real boost in confidence as it meant that the worst of the terrain was over. Considering the steepness of the terrain we made fairly fast progress down towards Nugget Creek and we stopped there for our breakfast. From here we had to follow the creek for another mile before we would try and pick up the remains of an old mining path. We had the GPS co-ordinates for the start of the path and although we had been very sparing with our use of the GPS (I’m a bit of a traditionalist!) this was one time that we were definitely going to use it. Otherwise finding the start of the path would be like finding a needle in a haystack (only harder!). Getting to the start of the path was a bit harder than we thought – we had to do some more deep river crossings across Nugget Creek but eventually we made it. The GPS took me to where it thought the start of the path was – but the actual path was not that clear (only a few people would have walked on it over the last 80 years!). So, using a bit of judgment, I started to pick a route through the willow and the brush where I would have built a path. Luckily we soon picked up the track and as we walked towards the Kuskulana River the path got more and more obvious until it eventually led us to an old mining road that was still littered with lots of interesting artifacts from when the area was mined. After what we had walked on during the last eight days the old mining road felt like a motorway and for the first time we were able to walk at over one mile per hour. We stopped for a rest at Nugget Creek Cabin at about 6pm. This was officially the end of the trek but we still had another 14 miles to walk along an ATV track until we reached out pick up point. We were being picked up at 8am the next morning! Even though the end was in sight we still had a little way to go! After leaving the cabin and crossing the Nugget Creek for the last time we bumped into a family from Anchorage who were camping at the trail head – these were the first people that we had come across in eight days. We were very happy to see them and I think they thought we were mad after we showed them where they had come from on the map. They told us about a camping spot seven miles down the ATV trail (halfway camp) and we headed off along the muddy trail. It was getting dark when we arrived and camped. As we were cooking dinner it seemed a million years ago since we had woken up in Mordor in the snow that morning! We had seven more miles to go to our pick up point which we figured would take us between 3–4 hours. We set the alarm for 3am and headed to bed in a fairly cramped campsite. The group was obviously keen to get to the end and I was the last to leave the campsite that morning. I slowly caught everyone up one-by-one as we walked towards our pick up. The track was easy to walk along and for the first time in days I didn’t have to think about where I was putting my feet. I arrived at the trail head at 07.30h and washed in the Strelna River and changed into my (slightly) cleaner clothing. The group arrived one at a time and completed the final river crossing before getting to the trail head. There was a lot of laughter and a few tears (of joy!). But we did have one problem, no pick up! Mark volunteered to carry on walking along to the McCarthy Road and returned about 45 minutes later with Edward our shuttle driver. We loaded the van and started out eight our drive to Fairbanks. In my next Alaska Reflections post I’ll talk about what we got up to before we flew north of the Arctic Circle to prepare for our canoeing journey. The alarm went of at 5am and I was feeling tired! Despite our previous long day we packed our stuff up quickly (in the rain) and started the push up towards Surprise Creek Pass – the second pass of our journey. After about two and a half hours we reached the saddle before the pass and huddled in a small corrie, next to a stream to eat some breakfast. Halfway though breakfast it really started to rain heavily and we didn’t hand around in getting packed up, climbing up and over the pass and down towards Surprise Creek. The guidebook was right! and to make matters even more interesting it looks like there has been some significant changes to the upper stages of the route since the brief guidebook description was written a number of years ago…. oh... and it was still raining! Anyway, we stumbled, slid and slowly navigated our way down to Surprise Creek. We climbed up the other side and then completed a nightmare up, and down traverse until we reached a willow covered ridge that we new we had to follow down to the Kotsina River Valley. The first part of the Willow was actually quite good fun as it was high. But then we had to drop down a steep scree slope into an unnamed river that flowed all the way to the Kotsina. The river was overgrown and it was almost impossible to walk along the bank. So in the end we did the only sensible thing – we walked and waded down the river! Eventually we made it to the floodplain of Surprise Creek. It looked like a moonscape and you wouldn’t want to be anywhere near this area during the snowmelt or ice break up. The water marks and flood debris on the trees must have been at least 10m high! The good think was that the scoured ground was fairly easy to walk along and we picked our way through the bush to the Kotsina River. Again, it had been another long day or crazy terrain. We pitched our tents by the river and it even stopped raining as we ate our dinner. I also took a bit of time to go though some of the food barrels of some of the young people – I was worried that they hadn’t been eating as much as they should (and we didn’t have a lot to start with!). After dinner – it was time to tackle a more series problem…. If we were going to continue with our route we would need to get across the Kotsina River and it was massive. Glacial fed combined with a massive amount of run off from the last few days. There was no way that we would be able to cross where the guidebook suggested and we hoped that the water level would drop during the night to make it a fairly easy crossing in the morning. I stuck my head out of the tent at 04.45 it had been raining all night and the river had dropped a little bit but there was still no way that we could cross. We needed a plan… but first we decided we needed a lay in (in any case it was Clive’s birthday). A 6.30am 'get up' was declared and I crawled back into my sleeping bag. The group seemed to appreciate the extra hour and a half in bed (although Emily’s eyes looked a bit puffy!) and we had breakfast at the camp before briefing the group on the plan (that was rapidly evolving by the minute!). Our first choice was to follow the Kotsina River up-stream. As we got closer to the glacier the river braided into three smaller rivers and there would also be less run off contributing to the flow. When it was safe to do so we would cross the river and then follow the Kotsina back down stream (on the other bank) before rejoining our route. So off we went – the terrain was actually not to bad and we made fairly quick progress along the gravel bars towards the snout of the glacier. However, after about an hour we noticed steep undercut cliffs on the opposite bank. Even if we could cross the river there was no way we would be able to get around these cliffs on the way back? We were stuck… time for plan three! Plan three consisted of us retracing our steps and seeing if we could find anywhere to cross downstream. If we had to we would have to abandon our route and either request an air pick up from a gravel bar or walk out of the national park another way via one of our planned escape routes. Anyway, we walked back down the river past where we had camped the night before and carried on downstream. I was worried because I could see that in about three miles time the river was going to flow into a gorge and it would be a difficult climb to get around it. Leaving the group to have some lunch Clive, Mark and I made several attempts to get across the river but it was just to deep and to fast. After one of our many attempts we decided to give up for the day – if negotiating the gorge was our only option we were going to need to do it after a rest. I got the group to make camp on a huge gravel bar and we collected firewood for a massive fire. The rain even stopped for a couple of hours. While the group were drying out Mark, Clive and I took a wander down to the gorge. I wanted to see what it was like before deciding if we were going to walk along it or go around it. However, as we got closer we realized that the gradient of the river flattened out and the river got a lot wider before narrowing again into the gorge. Standing on the bank we picked a virtual path through the river (it was now braided in about six sections) and decided that as we were wet already we might was well see if we could get across. It took us about an hour to find a safe route – but we made it. Then we slowly retraced our steps and left rock cairns to mark the way for the next morning before heading back and rejoining the group who looked a lot warmer than us around a massive fire. Our rest afternoon had cost us about half a day of time. But we now had a route and we were safe and warm – we were back on track to complete what we had set out to do. In my next post I’ll talk about the last few days of the trek where we negotiated an old mining camp from the 1930s gold rush, slept in something resembling mordor and it stops raining for a bit and starts to snow! It was a wet and cold morning for our 5am get up (of course it didn’t help that there were huge lumps of glacial ice on the beach we were camped on and that the wind was blowing off Long Glacier into our little ice cove). The first challenge of the day was to cross the river and then follow it up the valley until we could get over the first of the three ridges that we would need to negotiate on are route. The river is glacial which means that it dropped significantly overnight as it gets cooler and the glacier up the valley stops melting as much. Our crossing point only ended up being ankle deep. This would be the first of many river crossings over the next few days, some were very big (more on that later) and some of them were smaller but we stopped counting at 50 crossings! River crossings are one of the most dangerous things that you will do on a wilderness trip. Fast flowing water, uneven ground and heavy backpacks are not a good combination. I spent time briefing the group on the beach that morning and would continue to do so until I was satisfied that the group could individually risk assess each water hazard and apply the best crossing strategy. For the more complicated cross, I would always go first often then returning for the rest of the group – our feet remained wet for the eight days! After a quite a slow crossing (we would get a lot quicker) we made our way up the side of the river and had our first experience of bushwacking through Willow – it was a fun introduction but we had no idea what would be waiting for us in a couple of days time. We stopped from breakfast at about 08.30h and then started our long climb up towards the ridge (Fall Creek Pass) and our crossing point. It was steep and on scree and we had to negotiate patches of snow near the top. After the fitter members of the group had rested at the top some descended to help the ones that were struggling. Considering the conditions the teamwork, determination and perseverance of the group was outstanding. We hung around briefly on top and then descended a lovely tongue of green to the next valley. It was nice to not be walking on scree and it even stopped raining for about an hour! We found a great little camp spot next to the Fall Creek, ate and were all in bed by 8pm! It had pretty much rained steadily through the night and today ended up being one of the hardest days on the trek in terms of terrain, route finding and general wetness! The river that we were camped in was the upper stages of a hanging valley that flowed into the second of the large U-shaped valleys (The Kluvesna River Valley) that we needed to cross during the route. Following the river was fine and we made quick progress along gravel bars and zigzagged between different sides of Fall Creek. The problem of course was we couldn’t follow the Fall Creek for to long as rivers that flow in a hanging valley quickly become waterfalls as they flow into the main U-Shaped valley! So, as the terrain started to change we stayed high along the open tundra until we got to the shoulder of the main U-shaped valley (Kluvesna River). The guidebook description was a bit sketchy here although it does tell you to look out for the 30ft cliff! Anyway, visibility was poor, we couldn’t see the bottom of the valley and the terrain ahead was steep and covered in willow. The next few hours relied completely on judgment we loosely followed a compass bearing and I kept my eyes closely on my altimeter as we descended the horrendous slope. We had to stick really close together as a group as the sound of Fall Creek (going over the waterfall!) made hearing difficult and the high thick willow (above head height) combined with the steep ground meant that you couldn’t see anyone more than five metres away. We were soaked through to the skin within minutes because of the fighting through the bush and the whole experience felt completely surreal. One of the boys took a slip and ended up upside down in a bush and we only had time to get a quick photograph before he was extracted by other members of the group. After descending about 1000ft we reached a small clearing and the mist lifted just enough for us to get a glimpse of the Kluvesna River. This was a great moral boost for the group but I was thinking, ‘how are we going go get across that?’ it was huge! We kept fighting out way through the trees and as the ground leveled out our bearing took us across an old river bed. These are like small roads through the bush (although bears like to use them as well!). We made quick progress on the river bed and eventually got to the Kluvesna River where the trees opened out and we could rest. The Kluvesna River is glacial fed (combined with all the run off from the sides of the valley) and it was still raining. There was no way that we could cross at the point we were at by the guidebook suggested heading up towards the snout of the glacier. Glacial rivers tend to be more braided and less steep here. They are also not as swollen from the rain water run off. So off we went along the side of the river. It was a wet but very dramatic walk next to the roaring river, getting closer and closer to the glacier in a huge U-shaped valley. The problem was the river wasn’t getting any smaller! As we approached the snout of the glacier I went ahead to check out the route. I was pretty convinced that as long as we could get onto the snout we could walk across the glacier – in any case it was our only real option! Getting on to the glacier was actually not very much of a problem. Some loose moraine led to an ice tongue which formed a perfect bridge to safe ground. We had everybody on within 10 minutes. We then negotiated the bands of moraine and found another ice tongue leading right of the glacier. It was easier that I thought it was going to be. However, the next bit wasn’t as easy. Ideally it would have been great to camp here. It had been a massive day and everyone was very tired. The problem was there were no flat spots for the tents and no water. The only option was to start the steep accent towards Surprise Creek Pass (the second ridge of the route) as there were a number of streams at higher elevations. So, that’s what we did, you could see where you had to go, ‘up’, and we spread out as a group each of us taking our own time and going at our own pace as we climbed higher and higher back into the mountains. Waking was pleasant, the views were beautiful but the ground was steep. After we found a spot to camp by a spring the group were brilliant again at helping each other. Going back for some of the other bags, putting each others tents up and making hot drinks and dinner. We had stated walking at 6am and we finished at 8pm – it had been a brutal day. But as I sat there that evening watching the dynamic of the team in this unique place that I am convinced no one had ever camped in or even found before. I felt very proud of what we had already achieved and the group surrounding me. It’s wonderful to see discomfort give way to humor and its amazing the impact a sachet of hot chocolate and some Raman noodles has on the mood of a wilderness camp. In the next post I’ll look at day 5 – 6 of the trek where it rains some more and we consider an evacuation due to another swollen river. I was recently described as being ‘mad’ by a colleague when I explained to them that I would be spending four weeks of my summer holidays with a group of young people in the Alaskan wilderness. I think they were ready to called ‘the people with the white coats’ when I further explained that I had organized the expedition on a piece of blank paper and a few ideas. That I wasn’t being paid for my time while I was away and that I was in fact funding my own way onto the trip and contributing exactly same amount of money as each of the young people. I would of course be accepting accountability for the group during the whole four weeks as we operated in one of the remotest parts of the world. Well perhaps an experience like this is not everyone’s cup of tea but for me running and organizing youth expeditions has become fairly normal summer experience during the last 14 years. Since 1996 I have organized and led nine youth expeditions of not less than 21 days to some very challenging environments. Many of these ventures have been approved by organizations such as the Dorset Expeditionary Society (where I am a trustee), The Young Explorer Trust and the Duke of Edinburgh Award. By not employing guides or local hosts and by relying on a carefully selected expedition leadership team I am able to keep the costs for the young people down while ensuring high standards of safety and care for all of the group. I like planning, organizing and accepting accountability for these trips and spend hours preparing maps, researching expedition areas and working on the logistics. I select my expedition team at least nine months before we depart for the expedition area and spend at least six days working with the group in the UK and training the team before we depart. While we are away we operate as a close family ensure the welfare of all. I have always believed that extra-curricular activities are one of the most important roles of a teacher and outdoor experiences are one of the things that really gives a school or youth organization spirit. I have learnt more about leadership and management from my summer adventures with young people than I ever have from a formal or academic leadership course. My expeditions always have objectives for example with under 18s I have canoed the Bowron Lakes of British Columbia, Climbed Mt. Rainier in Washington State, Trekked the Wonderland Trail in Mt Rainier National Park, Climbed the Marmolada by Via Ferata and Glacier in the Italian Dolomites, Paddled Beaver Creek in the Alaskan Interior, Sea Kayaked 200 miles across the Prince William Sound in Southern Alaska and gathered data for research papers in remote parts of Wyoming. But as well as these physical and academic objectives I believe the youth expeditions that I run are mentally tough. It’s hard to live in the wilderness for a prolonged period of time and it’s the routine of wilderness survival and the ‘thinking time’ associated with it that increasingly young people struggle to cope with. For me the mental challenge remains the most important parts of a young persons development – after all if we can’t develop young people that are mentally strong what hope will we have for the future leadership of our society? The ‘Gates of the Arctic’ Alaska 2010 Expedition had two main objectives. These were to trek in the Wrangell-St. Elias and to Canoe the Noatak River from its headwaters in the Gates of the Arctic National Park to Noatak Village a distance of nearly 400 miles. Over the four weeks that we were away we were quite simply punished by the weather and Alaska threw every type of it at us from blistering heat, unforgiving rain and even snow. This combined with the being totally self-sufficient during both objectives and the remoteness of the expedition made it the toughest trip I have ever done with young people. The group were well prepared and humor, teamwork and compassion conquered the hardship of the environment. We succeeded in both our goals and it was an absolute pleasure to work with such talent. I’ll document the expedition in the next few posts. The application phase is now live for my 2010 Youth Expedition to the Gates of the Arctic National Park in Alaska. Please feel free to pass on any details of this expedition to any young people aged 16 – 21, at the time of expedition departure, to young explorers within your schools. As with all Leading Edge Expeditions I will organise and run the trip voluntarily and contribute a full team member payment to the expedition account. I’ve been a volunteer expedition leader with Leading Edge since 1996 this has always been my philosophy. During this time I have had the opportunity to lead young people to some of the remotest parts of the world including Mt Rainier, British Columbia, Alaska, Dolomites and Wyoming. On a personal note I hate the glossy outdoor education brochures that come into schools from commercial companies, talking about chance in a life time opportunities for young people. In my experience these are often little more than adventure package holidays with a massive price tag. You can find out more about the 2010 Gates of the Arctic Expedition over on the website. Explorers are drawn to Alaska by its colourful reputation and are always stunned with what they see. There are mountains, glaciers and rivers all over the world but few are on the same scale or as overpowering as Alaska. Alaska has the third longest river in North America, 17 of the countries 20 highest peaks and 5000 glaciers, including one glacier larger than Switzerland! The Arctic winters are one long night and the Arctic summers are one long day. Above all Alaska is most famous for its state bird, the mosquito! The expedition will fly from London to Anchorage. From here will have an opportunity to pick up supplies, pack and re-organise equipment for our expedition. Initially we will travel east to the old miming town of McCarthy (population 42). McCarthy will be our staging post for the first expedition objective, trekking in the Wrangell-St. Elias National Park. The group will attempt to hike between the Mt Wrangle Plateau and Nugget Creek. The distance is just over 50 miles, but due to the harshness of the terrain the expedition team will be lucky to travel any quicker than one mile per hour. The trek is likely to take about 7 days and we will be fully self-sufficient after we have been dropped into the wilderness by bush plane. During the trek the group will learn self-reliance, teamwork and wilderness camping techniques (eg: dealing with bears). During the trekking phase terrain will include glacier, snow and river crossings on exposed terrain. Group members will throughout the trip assume responsibility for some major aspect of the expedition itself. On completion of the trek the group will travel north to Fairbanks (just south of the Arctic Circle), where we will rest and prepare for our Arctic adventure. From Fairbanks we will take a wilderness flight to Bettles which is situated north of the Arctic Circle. Bettles is the staging post for most Arctic expeditions and this will also be where we hire our canoes for our journey across to the west coast of Alaska and the Bering Sea. In Groups of three we will be flown (with canoes strapped under the bush plane) into the Gates of the Arctic National Park. We will be dropped near the headwaters of the Noatak River, one of the USA’s only designated Wild and Scenic Rivers. From here we will use canoes to travel down the Noatak to the Bering Sea and to the Inuit Village of Kotzebue. The entire journey is 360 miles and it is expected to take the group 16 days of ‘full on’ paddling. Open canoes make ideal crafts for an explorer and have been used extensively in North America for hundreds of years. They can be paddled, poled, sailed and portaged. They also make excellent shelters and provide plenty of space for expedition supplies. Full training in the use of open canoes will be given before the expedition departure and further training will be given in the field. From Kotzebue the group will travel back to Anchorage for some rest and relaxation before heading back to the UK. A high environmental ethos will be applied throughout the expedition. We will be trekking on one of the world’s most delicate eco-systems (the Alpine Tundra) and canoeing a designated ‘Wild and Scenic’ river. Expedition members will be expected to show care and respect for this unique environment. Being safe and caring for the welfare of every individual is essential on any expedition be it a low level trip in the UK or the ascent of a mountain. This has always been a priority for us, and will continue to be so. High media attention on recent incidents has brought safety to the point where even measured, responsible risk taking is expected to be taken out the expedition equation. This sterile attitude only serves to hold back a young person’s personal growth. Life is about taking risks especially for the development of our future leaders. A Wilderness expedition is obviously a ‘risk’ activity but the skill of the leadership team will achieve the balance between safety and challenging experience for the young expeditioner. To get the right team together, applicants will face a rigorous selection process to determine if they possess the right qualities for such an expedition. Some experience of open canoeing and hill walking is an advantage, but is not a pre-requisite. We do not anticipate a world class explorer at this stage! Rather we invite applications from young people who want a challenge within a team environment, and who want to develop their leadership potential. Initial training will take place before we leave the UK. You can find out more about the 2010 Gates of the Arctic Expedition including how to apply over on the expedition website.